What are the top landmarks in Munich? Catch an event at Allianz Arena during your trip to Munich.Experience the area's lively festivals and fascinating museums. The Munich City Centre neighbourhood welcomes visitors, with its convenient options for breweries. Part of the neighbourhood’s charm is its architecture. For a taste of local culture, you can visit the museums and art scene. Altstadt-Lehel is a welcoming neighbourhood with many tasty options for breweries, cafes and restaurants. The neighbourhood’s charm comes through in its architecture. You can satisfy your cultural palate with museums and shopping. Schwabing is a welcoming neighbourhood with many tasty options for breweries and cafes. The neighbourhood has many appealing features, among them its architecture. Other highlights include the local museums and shopping, as well as the natural splendour of the gardens. Maxvorstadt is a welcoming neighbourhood with many tasty options for breweries, restaurants and cafes. The neighbourhood has many charming qualities, with its architecture among the more noteworthy. You can satisfy your cultural palate with museums and shopping. Ludwigsvorstadt is a welcoming neighbourhood with many tasty options for breweries, cafes and restaurants. The neighbourhood’s charm comes through in its festivals. Broaden your horizons with some local shopping. The Pasing neighbourhood welcomes visitors, with its convenient options for restaurants. Broaden your horizons with some local shopping. The Torbräu is perfectly located in the center of town a mere steps from the train that takes you to Munich from the airport. The Torbräu staff got us tickets on the train when we departed and transported our luggage to the train at no charge. The staff was wonderful. Andreas got us tickets to the nearby auditorium to see a wonderful classical music performance. The included breakfast is also wonderful and the staff at the restaurant did a great job keeping my coffee cup full. One word to describe to Torbräu is PERFECT. Munich attracts a wide range of travellers, from holidaymakers and business people to beer lovers who come for the famous Oktoberfest celebrations. Every year, around six million visitors descend on the city to enjoy some typical Bavarian culture and, of course, beer. Hotels in Munich book up quickly in September and October, when the festival takes place, so it’s a good idea to plan your trip several months in advance. Munich in the run-up to Christmas is also a delight, thanks to the city’s famous festive markets. Christkindl – one of the oldest markets in Europe – is the main one to visit in Munich, with live music, Christmas craft workshops and hundreds of cute wooden huts selling handmade homeware, snacks and mulled wine. 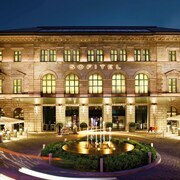 Like any major city, the choice of hotels in the Bavarian capital is extensive. 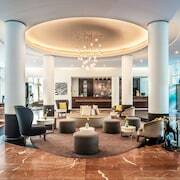 You won’t be disappointed if you’re looking for an impressive five-star hotel in Munich. There are some big hitters in the historic centre, such as the iconic Hotel Bayerische Hof and the grand Mandarin Oriental München, in a neo-Renaissance building that was formerly an opera house. Travelling to Munich on a budget? No problem. 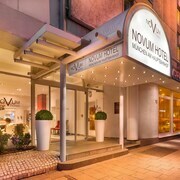 Cheap hotels in Munich abound, many of which are clustered around the main train station, such as Hotel Dolomit, which has offers modern soundproofed rooms, and the stylish Vi Vadi Hotel Downtown Munich. For historic cobbled streets and medieval squares, stay in a hotel in the Altstadt-Lehel. Here you will also find some of the city’s most famous attractions, such as the Frauenkirche church, Viktualienmarkt gourmet food market and Maximilianstrasse, the main shopping street. This area is very pedestrian-friendly and all attractions can be reached on foot. North of the Old Town is Maxvorstadt, the cultural heart of Munich that is home to the museum quarter. Around a dozen world-class institutions can be found near Königsplatz. Highlights include the three Pinakothek museums and Museum Brandhorst, which focuses on modern art. 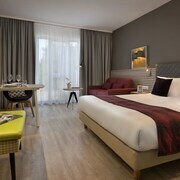 Stay in the nearby Ruby Lilly Hotel Munich for understated modern rooms, a roof terrace and bar. 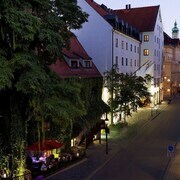 If you’re in town to sample Munich’s nightlife, book a hotel in Schwabing-Ost. This trendy district, with plenty of shops, cafes and bars, has been gentrified in recent years but still has traces of its bohemian past. Here you will also find Englischer Garten, one of Europe’s biggest city parks, and a lovely place for a relaxing stroll. Vibrant Glockenbachviertel, near the River Isar, also has great nightlife and is the centre of the city’s gay and lesbian scene. A good hotel choice here is the The Flushing Meadows Hotel and Bar, which has chic rooms designed by local creatives and a rooftop bar with panoramic views. Does Munich Have Business Hotels? Munich is a business hub, thanks in part to its location in the centre of Europe, and many major brands call the city home. 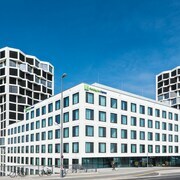 It’s not difficult, therefore, to find a business hotel in Munich that has a conference venue and hundreds of rooms. Individual travellers can find hotels near major company headquarters that have the necessary amenities, such as free Wi-Fi. 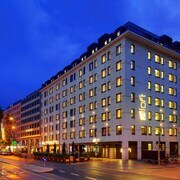 Mercure Hotel Muenchen Neuperlach Sued is an excellent choice for those visiting Siemens, for example, and has nearby train links to the city centre. Does Munich Have Family-friendly Hotels? 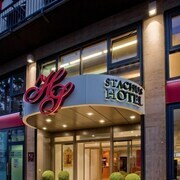 There are plenty of family-friendly hotels in Munich. If you’re taking the kids on a sightseeing trip, you might want to consider choosing a mid-range location and a hotel that has cots and other child-friendly facilities, such as Harry’s Home Hotel in Moosach. Youngsters will find it hard to be bored in Munich, thanks to attractions such as Tierpark Hellabrunn, which feels more like a nature reserve than a zoo. Another highlight is seeing the Rathaus-Glockenspiel in Marienplatz chime at 11am and 5pm every day, while children are welcome in beer gardens, too – many have playgrounds. And all of that's before you've got the many kid-friendly attractions in the surrounding area, including LEGOLAND Deutschland, just over an hour's drive away, between Munich and Stuttgart. If you're not decided on Munich yet and are interested in Germany's other great cities, take a look at the capital with our hotels in Berlin or explore central Germany with our hotels in Frankfurt. Explore Munich with Expedia's Travel Guides to find the best flights, cars, holiday packages and more!